Fulton County Spelling Bee winners were, front row, from left, Jadon Lohman, Blaney Huffman, and back row, Kiernan Wealleans, Sydney Hageman and Jordan Bailey. The annual Fulton County Spelling Bee was held last Tuesday evening in a room filled with almost 200 individuals listening to pronouncer Andrea Johnson, Pike-Delta-York Local curriculum director, call out words such as alderman, wikiwiki and seersucker. The Northwest Ohio Educational Service Center (NwOESC) in Archbold served as the host site for the competition. Thirty-eight students from Archbold, Evergreen, Fayette, Pike-Delta-York, Pettisville, Evergreen, Swanton, Wauseon Exempted Village and Holy Trinity Catholic schools earned the right to compete. The overall winners from grades four through eight competed with the hope of advancing to the regional bee in Toledo. The top three finishers for each grade were awarded plaques to commemorate their achievement. The winners for each grade were: Fourth grade, Blaney Huffman, Archbold Elementary; fifth grade, Jadon Lohman, Delta Middle School; sixth grade, Jordan Bailey, Swanton Middle School; seventh grade, Kiernan Wealleans, Swanton Middle School; and eighth grade, Sydney Hageman, Archbold Middle School. Other Swanton Schools participants were Conor Yates, Aidan Vinson and Nadir Marashdeh. Evergreen participants were Callie Wyse, Troy Manz, Hannah Damaske, Keigan Schuster, and Brayden Bull. Holy Trinity qualifiers were Megan Clancy, Ethan Grasser, Sean Rafferty, Caleb Grasser, and Kelsey Rose. 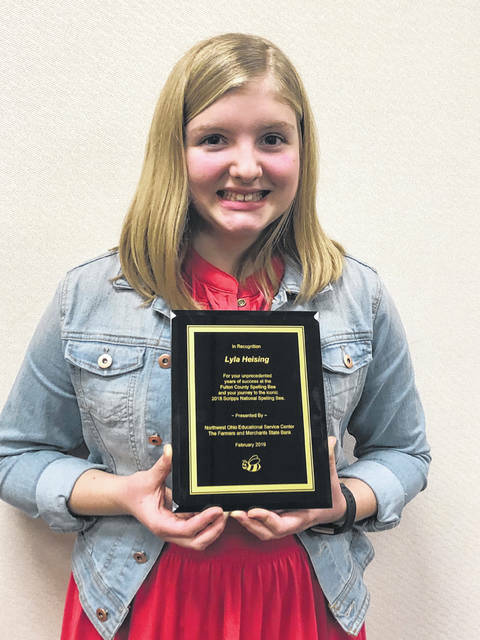 Also at the event, special recognition was given to Lyla Heising, a freshman from Pettisville Local Schools who was awarded a plaque for her past accomplishments. Heising qualified and participated in last year’s Scripps National Spelling Bee in Washington D.C. after winning the regional bee sponsored by the Toledo Blade. She also won the Fulton County Spelling Bee for her grade level in 2018, 2017, 2016, 2015 and 2013. Heising shared her experience with the audience and offered words of encouragement and advice to this year’s spellers. 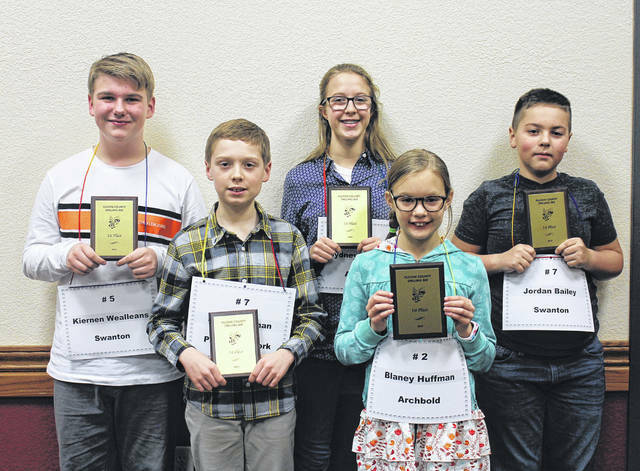 This year’s spelling bee was sponsored by The Farmers and Merchants State Bank making it possible for the top finishers to receive an engraved plaque. Additional sponsorship comes from The Toledo Blade and The Ohio Lottery Commission. All students received ribbons and certificates of participation. The event was coordinated by Stacey Parrish, education consultant, from the NwOESC. The five winning students move on to The Blade Northwest Ohio Championship Spelling Bee at Owens Community College on March 16.
https://www.swantonenterprise.com/wp-content/uploads/sites/23/2019/02/web1_Spelling-Bee-winners-2019.jpgFulton County Spelling Bee winners were, front row, from left, Jadon Lohman, Blaney Huffman, and back row, Kiernan Wealleans, Sydney Hageman and Jordan Bailey.